We were delighted to support the combined BSCR / BSGCT conference held in Glasgow between the 20th and 21st of June by direct sponsorship and hosting a trade stand in the commercial exhibition. The meeting was well attended and featured oral and poster presentations which focused on data acquired by the high resolution blood flow imaging system. 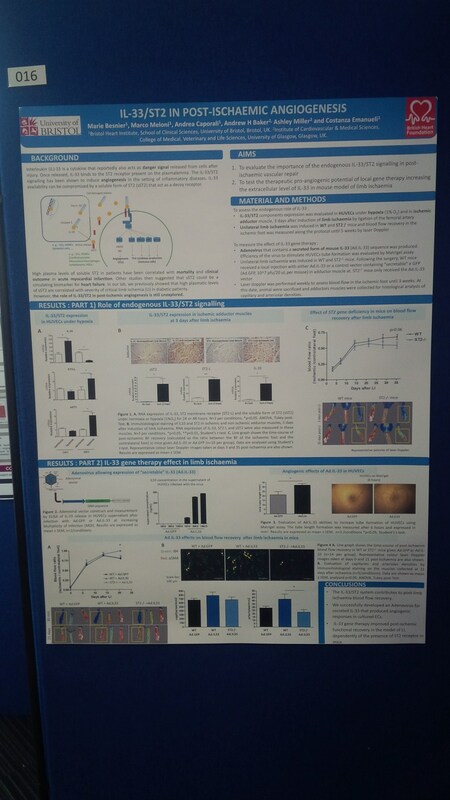 Featured data included a poster presentation from the University of Bristol (illustrated), presented by Marie Besnier and an oral presentation from University of Edinburgh. Congratulations to all who presented. The moorLDI2-HIR has been optimised with many unique features, earning it an industry leading following for the hind-limb ischemia assay, and related arteriole- and angio-genesis research assays. For further information on this and other systems and applications, please do get in touch by the usual means!